In honor of Blue Door Consulting turning 15 years old in 2017, we have been reminiscing about some of our creative marketing campaigns of the past 15 years. In the last two installments, we talked about successful marketing campaigns that impacted our community and created positive change (read the first and second installments). Now, we are bringing you three of our most heart-warming marketing projects that gave back to the community and helped support good causes. Peter and his wife have been dear friends of Blue Door Consulting, so when Peter began to suffer from a rare condition that affected both of his kidneys in 2013, we stepped up to help. It was evident Peter needed a kidney transplant, and fast. None of his friends or family members were a match. Desperate to find a match, Peter and his wife came to Blue Door Consulting with high hopes we could help find a donor. In our research of organ donation and kidney transplants, we found that in other parts of the country, billboards seeking organ donors had been successful. So, we created a billboard for now Interstate 41 with a simple message: ‘One kidney. One Life. Can you donate?’ A basic website gave users information about how they could learn if they were a match and how to donate. The billboard captured media attention, generating calls to the transplant coordinator. When WSAW-TV out of Wausau broadcast a story about the billboard and Peter’s plight, a match was made. We are so happy to tell you that Peter is now doing well and helped us celebrate our 15th anniversary in November 2017! Mental health remains a prominent issue in Winnebago County, where human service leaders are concerned about high rates of suicide, lack of access to treatment and increased self-medicated substance abuse. 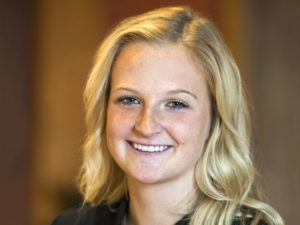 To combat these issues, the NEW (Northeast Wisconsin) Mental Health Connection wanted to create a system where individuals with mental health issues could easily receive information and help for their condition. They asked Blue Door Consulting to help them attain this goal by developing a database that could give patients the customized information and care they needed. We researched the relevant information patients needed when seeking care. We also asked all area providers to fill out an extensive survey about their facility’s providers and services. Once the data was gathered, the digital database-known as MyConnection-came together. 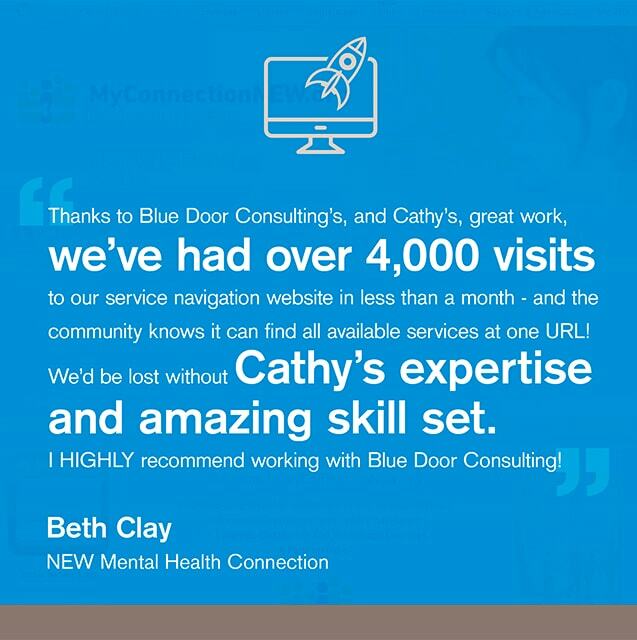 MyConnection is an online resource for individuals, families and agencies who have questions or concerns with mental health. The site provides information about all aspects of mental health, from alcohol abuse to schizophrenia, along with a listing of services available from area providers and organizations. Harbor House Domestic Abuse Programs and Christine Ann Domestic Abuse Services noticed a two-fold trend among the clients they serve: transportation limits the ability for a domestic abuse survivor to become self-sufficient, and those women often felt discouraged by the treatment they received at some auto repair facilities. To help their survivors, the two organizations decided to start an auto repair shop that was female-focused and did life-changing work. To bring their idea to fruition, the non-profits came to Blue Door Consulting. To start, we knew capital was needed to get this project off the ground, so our own Brenda Haines crafted a successful grant proposal. 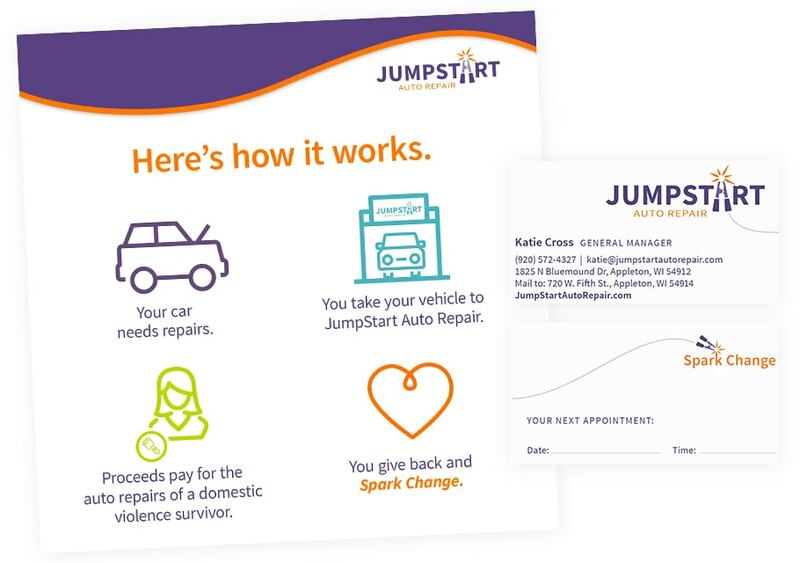 Those start-up dollars allowed the opening of JumpStart Auto Repair, an auto repair service run by women two days a week at Fox Valley Technical College in Appleton. The auto repair shop is open to all individuals, and proceeds pay for the auto repairs of domestic violence survivors. Once the business was off the ground, we created web content social media posts, both of which attracted media attention and brought business to the new startup. We are so proud to be a part of this creative marketing campaign that gave back, promoted change and helped domestic violence survivors. If you’d like to see how we can be a part of your next successful marketing campaign, contact us.